Peru Will Capture Your Heart and Spirit. From Machu Picchu, the jagged peaks of the Andes, draped in green velvet and capped in white, stretch to the horizon in every direction. Deep in the heart of Amazonia, the sun-speckled green tropical foliage cascades to the edge of the Tombopata River nearly hiding the bright red spike of the Bird of paradise and the iridescent blue Morphus butterfly. The views of Peru will astound and amaze you, and will remain crisp and clear in your mind's eye long after your trip is over and your photographs have faded. Cuzco, the jumping off point for Machu Picchu and the Amazon, is where the Inca and Spanish cultures met head on. Cuzco, the oldest inhabited city in the western hemisphere, was once the capital of the vast Inca empire that spanned from Chile to Colombia. After the conquering the Incas, the Spanish made Cuzco their capital. Today the picturesque squares, winding cobblestone streets, and the red tile roofs typify the colonial Spanish cities. 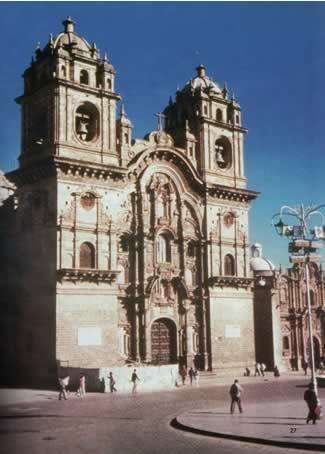 The main square, Plaza de Armas, is dominated by the cathedral which is built on the foundation of an Inca palace, as are many of the other churches and buildings. The massive Inca walls were built with such precision that they can not be easily replicated even with today's modern tools and equipment. There are, in fact, so well built that they are earthquake proof. The plaza is the ideal place to start a walking tour of the city. But first, sit and take in all the sights and sounds. On the church steps a lady, in a bright red full skirt and a brown bowler hat, and her llama, pure white except for the bright ribbons on his ears, seem frozen in time. Young girls with big dark eyes, rosy cheeks, and thick black braids, so colorful hand woven items. Under the archways that line the plaza tourists look through piles of hand woven sweaters in muted shades of brown and bright multi-colored Inca knitted hats. 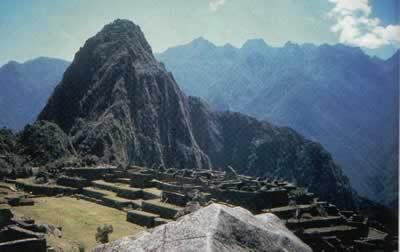 Fifty miles from Cuzco, protected by the Andes, is the mysterious Machu Picchu. Machu Picchu is reached by a train that leaves every morning from Cuzco. The train switchbacks its way up the mountain before reaching a bus stop for the final leg of the adventure. The bus chugs its way up the side of the mountain, at times coming precariously close to the edge of the road that drops off into nothingness. Here, at the top of the world, is a place that poses more questions than it answer Four centuries ago, for unknown reason~ the city was deserted and was slow I reclaimed by nature. Since 1911, when Hiram Brigham "discovered" Machu Picchu, the city has tantalized and intrigued everyone from the archeologists to the mystic to the tourist. It is not just the altitudes that will take your breath away. The view in ever direction is awe inspiring. 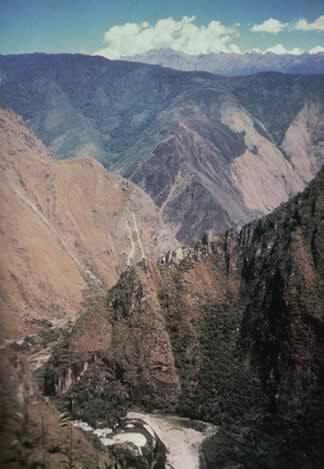 In some place the land drops straight down into the Urubamba Valley. In other places is descends in a series of steep terrace step that were used for farming. The names given to the various buildings and areas cause the imagination to run wild. Try to imagine the daily scene four hundred years ago in the Temple Sun, The Royal Place, The Watch Tower, The Temple of the Three Windows, The Chamber of Ornaments, The Jails, The Stairs of the Fountains, and the Main Plaza. One of the most unique features, perched on a rocky promontory, is The Intihuatana. Carved from a massive block of stone, the name means," the stone which was attached to the sun." 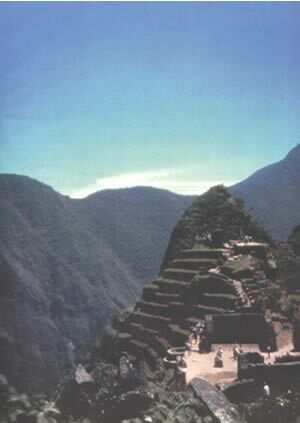 It is thought o be one of the most sacred spots in Mach Picchu and where the mysteries of the sun, moon and stars were unraveled. For many, wandering the streets and path of Machu Picchu, or just sitting and absorbing the views are a mind cleansing and a spirit renewing experience. Few will leave Machu Picchu taking with them some lasting impressions. The same is true of the Amazon. Less than an hour by air from Machu Picchu is one of the most remote places on earth. Parts of Amazonia around the Tambopata River have yet to be explored. Here is an entirely different world; yet, a place that will permanently affect the visitor. For here, it is easy to imagine what the world looked like on the dawn of creation. The trip from Cuzco to the Tambopata Wildlife Reserve is like a voyage back in time. On arrival at the open air airport in hot steamy Puerto Maldonado, visitors quickly shed their Andean sweaters and take deep breaths of the oxygen filled air. Puerto Maldonado typifies the remote Amazonian port town. The dusty roads are lined with bamboo houses topped with thatched roofs. A lady, holding baby, stands in the doorway checking out the strangers passing by. Only a few travel this way and visitors are of great interest. The dock area is actually a steep cliff with footholds dug into the dirt. Here mangos, bananas, and other tropical fruit arrive in dugouts from the deepest regions of the rain forest. From Puerto Maldonado, a motorized dugout makes the four hour trip up the Tambopata to the Nature Preserve. The river twists and turns its way up river. The thick green foliage cascades to the river's edge. In an occasional clearing is a jungle hut, nearby white hump-necked cows grazing at the river's edge. A brilliant red macaw flies ahead of the dugout. A dugout loaded with mangos quietly slips by, the passengers give a friendly wave. An iridescent blue Morphus butterfly flits along the shore. Squawking Macaws announce new arrivals at the Tambopata Natural Wildlife Preserve. Established in 1977, the preserve is designed for exploring the rain forest either with a resident naturalist or alone. Many trails have been developed through the forest. Resident naturalists are available for guided tours and to explain unique plants, animals and insects. Day or night the rain forest is a cacophony of sights and sounds. During the day listen for the bird that can wolf whistle with the best Italian male, smell the heavy sweet aroma of the cannon ball tree, taste the bark of the quinine tree, canoe on Laguna Chica, an oxbow lake, or fish for Piranha, or just sit on the porch of the lodge absorbing a. the sights and sounds. At night watch the day end from Sun Point, go alligator spotting along the shore, watch for the tapir's nightly rival in camp searching for kitchen scraps, listen to the approaching thunder storm, and count the shooting stars. Besides the trails trough the rain forest the Preserve has prepared gardens featuring tropical crops and curative plants favored by the local Indians. Even though the Huaraya Indians have had limited contact with civilization they welcome visitors with friendliness. 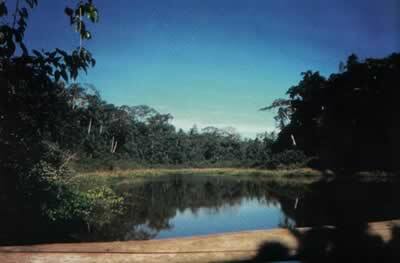 The Tambopata nature Preserve is located in the Madre de Dios region of the Amazon. It is one of the most undeveloped areas of Peru, which is a mixed blessing for visitors. Here the rain forest has been the least affected by man, consequently conditions for the tourist, though not primitive, are basic. The trade off is worth it, for here is one of the few places left in the world that has not yet been altered by man. There is a stupendous variety of birds, dragonfly, and butterfly species. There are over 1100 types of butterflies, 575 species of birds, along with many exotic mammals. New species are still being discovered. Peru, from Machu Picchu to the Tambopata, will enchant you and capture your heart and spirit. Long after you have left, you will cherish the pictures of Peru. You will never forget the view atop Machu Picchu or the sun setting on the Rio Tambopata.